The first step in installation is to head over to Gnomefiles.org and search for SystemClean. Here is the direct link. Now scroll to the end of the description (past all the version update information), and choose the download that is appropriate for you. Once downloaded, extract the archive and place it somewhere handy. Now, double-click to open the Setup file. You’ll immediately receive a warning, informing you that some of the things SystemClean can delete (such as cache files), could cause programs to not behave the way you’d expect afterwards, so proceed with caution. If you’re comfortable with the risks, go ahead and click the OK button to continue. 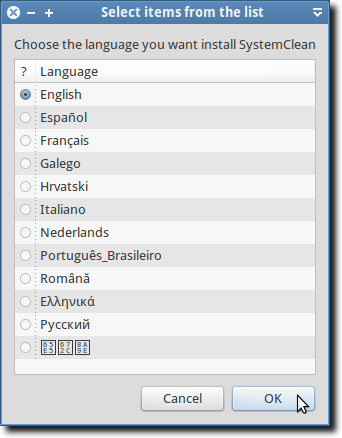 Now, simply select the language you want to use and click OK. 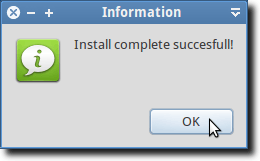 When installation is finished, you’ll receive a confirmation message. To use SystemClean, simply right-click on the Desktop. Navigate to the Scripts menu (this is new if SystemClean is the first system script you’ve installed), and choose SystemClean. 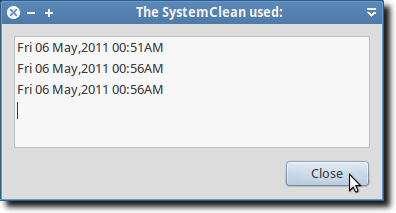 The next window you see will show you all the times you’ve previously used SystemClean. This window will be blank the first time you use it, but after will look something like this. You now need to click the Close button to continue, at which point you’ll see a warning that all programs need to be closed. This is key in case you decide to remove the memory cache of a currently running program, which could cause data loss for your open documents. Next is a list of everything that SystemClean can do. As you can see, there are currently seven different features offered by SystemClean. 1. Autoremove – this will remove packages from your system that were installed as dependencies for other programs, that have since been removed, while the dependencies remain. 2. Clean – this removes the installation packages that have been downloaded. 3. 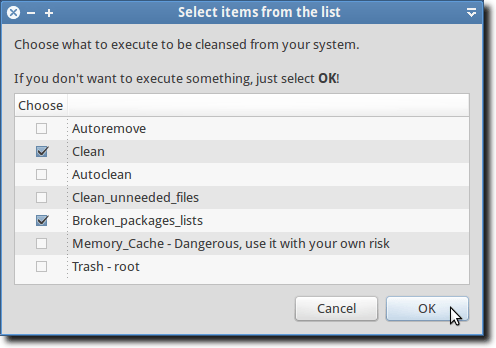 Autoclean – similar to above, but only removes the installation packages which are no longer available to be downloaded. In this way, you keep the installation package for all programs you have installed, which would allow you to reinstall from the package cache without downloading again. 4. Clean_unneeded_files – using Aptitude (instead of apt-get as the previous commands used), this will erase the configuration files for which no trace of their program currently exists on your system. 5. Broken_packages_lists – occasionally, you will end up with a broken package, which can’t be upgraded or fully installed. This simply removes the list of those programs. 6. Memory_cache – A potentially dangerous operation (as you’re warned), this allows you to remove memory cache files for certain programs. 7. Trash – This empties your Trash as the root user, which will get rid of files a regular user can’t delete. 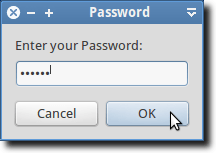 Once you’ve selected the operations you want to do, click OK. You’ll need to enter your password to continue, as all of the operations performed by SystemClean need to be run as root. 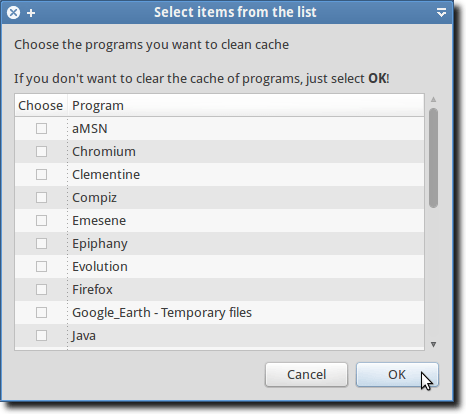 You’ll also need to select the programs to remove the memory cache from, or leave them unchecked to disregard this option. You’ll now be shown a window informing you that SystemClean is working. When the job is finished, you’ll get confirmation that everything went as was intended. Finally, a status report will show you how much disk space was freed up. And that’s it. 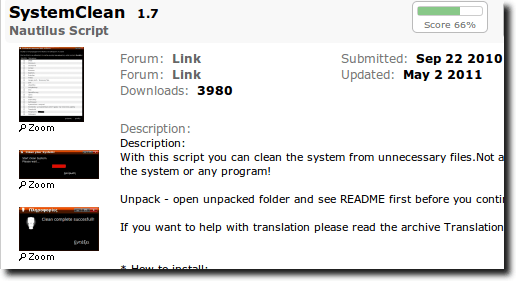 For the most part, SystemClean is a very safe, effective way to rid your hard drive of some unused packages, potentially free up some RAM (by cleaning the memory caches), and reclaim some hard drive space at the same time. The only issue would be if something would go wrong. Another nice thing about SystemClean is that since it’s a script (located in your scripts file in the Home directory), you can look at it to see exactly what commands are being used.